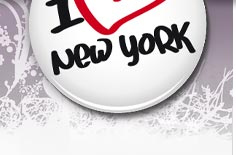 New York hotel guide - exclusive hotels and low budget hotels. There are many different type of accommodations in New York. From youth hostels to luxury Hotels. There are so many different types to choose from that there are something for all needs. Search for accommodations in the square above. To stay in Manhattan is very pleasant. During our visits to New York we have both tested to live outside and in Manhattan. And we can inform you that living in Manhattan will give you a different experience. You are there in the early morning when the city wakes up and also when the night arrives and all the colorful neon lights is lighting up. Together with hostelworld.com we offer you booking of budget accomodation at hostels in New York. A good budget offer. If you have any questions regarding hostels and your booking, please use the links below to get in contact with hostelworld. Thank you. If you want to search for other destinations please change the fields below. Midtown Manhattan near Rockefeller Center. Near Radio City Music Hall and Broadway. One of the most famous hotels in New York (1931). Now when the city has become much safer than earlier (2006) it doesn´t even feel unpleasant to walk even at night. But it has to be said anyway - as all big cities, get information about in which areas you shouldn´t be at night. To be present at Times Square is quite all right. 305 West 39th Street, New York - Breakfast is included in the price. Near Times Square. 42 West 35th Street, New York - Breakfast is included in the price. Near Empire State Building. 442 West 36th Street, New York - Midtown Manhattan. Near Madison Square Garden. 18 West 25th Street, Chelsea, New York - Breakfast is included in the prices. 31 West 71st Street, Upper West Side, New York - Breakfast is included in the price. At Central Park. 61-63 Chrystie Street, Lower East Side, New York - Breakfast is included in the price. China Town. 136 Ludlow Street, Lower East Side, New York - Breakfast is included. Lower Manhattan. 160 West 25th Street, Chelsea, New York - near Fifth Ave and Madison Square Garden. 234 W 48th Street, Times Square, New York - near Times Square. 522 W 38th Street, New York - Midtown Manhattan. Breakfast is included.